One of the more popular products from the game portfolio of Fugaso, this 5-reels 25-paylines slot game was built for fans of Arabic slots and punters looking for bonuses and solid cash prizes. With a jackpot of 12,500 coins and a range of different bonus features not only will this slot be able to entertain you, but it will also give you a shot at banking a good profit when you play for real money, thanks in part to its medium to high volatility. Learn more about the bonuses, payouts, and how to play this new casino game by reading through our full review. Play Brave Mongoose For Free! Visit the dry world of the Arabian Peninsula and join forces with desert animals to defend your town from venomous reptiles in the new Brave Mongoose slot. Like all Fugaso slots, Brave Mongoose is also available to play on mobile, tablet, or desktop. Apart from featuring symbols that can pay solid returns, Brave Mongoose also features a number of bonuses that’ll let you win something extra. Free spin games, two types of re-spins, as well as extras like sticky wilds and payout multipliers are all featured in this online slot to create a profitable and exciting game. 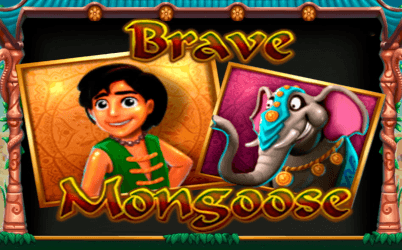 You don’t need to be an experienced player to enjoy the Brave Mongoose slot game. On the contrary, this Fugaso pokie is quite easy to set up. Since all 25 paylines are fixed, you don’t need to choose which payline you want to activate but you only have to worry about the size and number of your coins. The slot lets you choose a coin size between 0.01 and 1 credit as well as bet up to 10 coins per line. With all controls to a minimum, you can play for as little as 0.25 credits per round. With everything on max, however, you can spend up to 250 credits per spin (10 coins x 1 coin size x 25 paylines). Once you select how much you want to spend, you just need to press the spin button to start playing manually or use the AutoPlay controls next to it for automatic playing. Prizes are paid when you match two, three, four, or five identical symbols on an existing payline, from left to right. You can win prizes with up to 12 different icons which are split into high-, medium-, and low-paying symbols. The highest payout is 500 coins for a five-of-a-kind win, which when multiplied by the number of paylines gives this slot a jackpot of 12,500 coins. The lowest prize, on the other hand, is only 5 coins. However, what’s really interesting is that the slot can also shift from being a left-to-right game to a both-ways-to-win slot game, making even the lowest-paying symbols worth your attention. And when you switch to a mobile device, Brave Mongoose is even easier to control thanks to the slot’s large touch-friendly spin buttons. The game was built in HTML5, so it is compatible with most smartphones and tablets (regardless if they use iOS or Android OS) and it can even work with older mobile devices. Since you can only play in landscape mode, if you want to access the paytable or the audio/spin settings while using a phone, you will have to use the menu button to access them, which can be found in the bottom right corner. Apart from matching the same symbols, there are also other ways to trigger prizes in Brave Mongoose when playing with real cash. To begin with, there are the free re-spins which come in two types. The first, the Mongoose Re-spin, is triggered when a mongoose and snake symbols appear on the screen. When the mongoose wins a fight, the slot gives you a free re-spin during which the symbol will be turned into a sticky wild and a random multiplier of 3-9x will be applied to any prize collected. The Boy Re-spin, on the other hand, is activated by the boy and snake symbols. This feature gives you a re-spin where the boy is turned into a sticky wild and prizes are paid both ways. The snake symbol is actually a scatter symbol which can trigger 15 free spins games when at least three of the symbols show up on your screen, regardless of their position. To make things even more enticing, during the free spins round both the boy and the mongoose symbols will automatically turn into sticky wilds once they land on the reels. And to top it all off, you will also be able to trigger cash prizes in either direction during the free spins, from left to right and vice versa. There is a reason why Brave Mongoose by Fugaso is one of the most popular slots from the Cyprus-based game studio. This casino game can appeal to a wide range of punters, be they high-rollers or players looking for slots that can be played for cheap. Thanks to its medium variance, Brave Mongoose can pay out both small and big prizes, which makes it a suitable pick for punters looking for well-balanced slot games. However, with its higher hit ratio, getting your hands on large payouts will require more patience and effort. If you want to have bigger prizes at your disposal, you can instead try the Mummy 2018 from Fugaso. This med-high variance slot features cluster pay mechanics, all sorts of bonus features, and a max jackpot of 100,000 coins. For even better payouts, you can also try Fugaso’s Cosa Nostra, which features free spins games, a gamble function, and a three-tier progressive jackpot. More high-paying slots from Fugaso can be found at the top operators listed on our website, some of which also allow you to play for free and sample the slots without spending anything.